If you are shipping any products containing alcohol internationally, even if its in perfume, it is important to know the process -- and rules and regulations -- so you can ensure your product is shipped safely and not returned. The requirements are not the same as when shipping alcohol domestically. They are more complex. There are two options to start: shipping legally or illegally. Although shipping legally may seem the obvious choice, some opt for trying to be sneaky – but then see major consequences. Shipping alcohol illegally is a surefire way to run into snags in the process and to lose time, trust, and money. Although shipping alcohol legally can be a headache when compared with shipping other products, doing it legally will save you time, money, and credibility in the long run – and ensure that you can continue shipping your fine product. 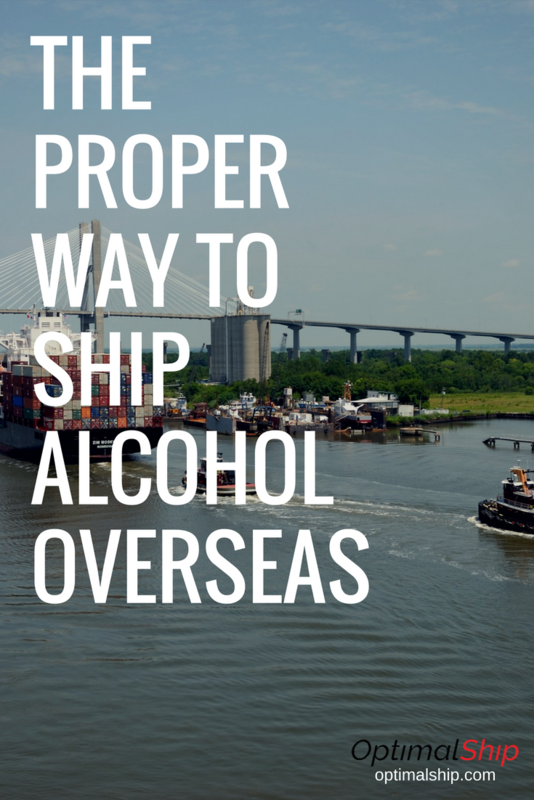 Shipping alcohol internationally is possible – and doable – if you apply for a permit, follow regulations on shipping alcohol, and learn how to import and export alcohol in the most effective way. Here’s what to do and know. You must have a permit to ship alcohol overseas. If importing and/or exporting alcohol is a new venture for you, you must apply for a permit to manufacture, sell, distribute, or import alcohol. Before commencing business, you must obtain a Wholesaler’s Basic Permit. Go to the Alcohol and Tobacco Tax and Trade Bureau website to find the form you need in order to apply. Then you will need to mail the form to their office. You must have and maintain a business office in the United States in order to obtain the permit. Be sure to allow at least 90 days to receive your Federal permit. Once you have your permit, it’s time to select a shipping carrier. Be aware that USPS will not ship alcohol. Even if you ship something else in a box that was previously used to ship alcohol, anything that may look like you are shipping alcohol must be covered, or your shipment will be denied. You can ship alcohol internationally through UPS, FedEx, and DHL as long as you follow certain regulations. Every carrier has their own rules. For example, FedEx requires the box to be labeled as something that contains alcohol by using this label. Because alcohol is considered a dangerous good due to its flammability, it is a fully regulated material. Regulations include specific requirements on how to pack and label your products, as well as paying duty and surcharges for shipping alcohol. Regulations vary by importing and exporting countries and based on the carrier you choose. For example, you cannot ship alcohol via DHL without a license and an approved facility. Although there is huge variance, there are four universal rules. You must advise your carrier that your package contains alcohol. 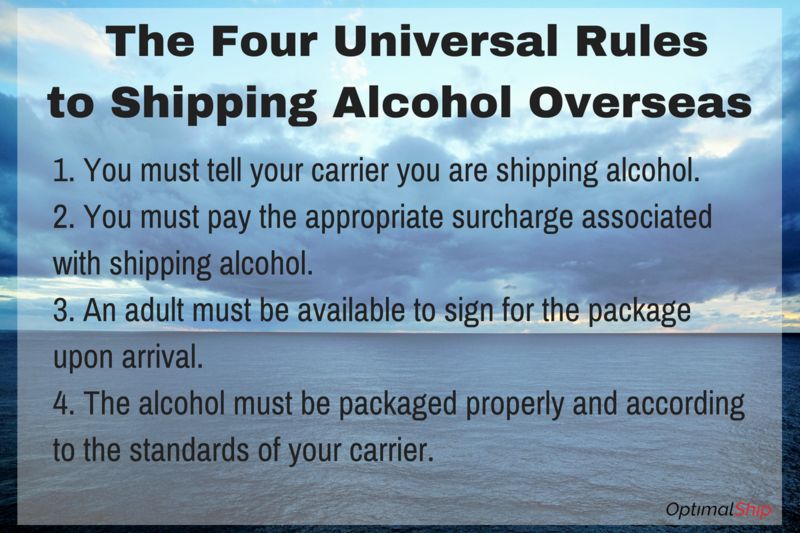 You must pay the surcharge associated with shipping alcohol. You must have an adult sign for the package. You must package the alcohol properly. Packaging must be UN pressure standard, sealed closed and leak proof, and use proper cushioning. You must label your product as containing alcohol with the correct markings, and mark that your product contains alcohol in the Commercial Invoice Description. You must follow the TTB’s laws and regulations, as well as regulations of the country where the alcohol is being imported or exported. This includes paying duties and fees. Requirements are different based on exporting and importing country, what product is being shipped, and whether the product is being shipped with taxes previously paid or not yet paid. There are also different requirements based on what state you are shipping from/to in the United States. Although there are quite a few regulations -- and fees -- for shipping alcohol across borders, there are a few ways you can save money. By following correct packaging and labeling procedures, knowing regulations, and shipping by vessel, you can save money, time, and hassle. If you're totally stumped and need some extra help, we've created a quick reference guide to shipping alcohol overseas! It includes a bonus checklist to help you stay organized. If we can't help you with it, we'll figure out who can! Stick around for lots of advice from the experts.